Our room was not ready at check-in, so we had lunch and drinks near the main pool. The poolside café offers a small menu of salads, burger, and wraps for a very Americanized selection. Other than delicious yucca fries, the menu did not really offer much on the way of traditional Puerto Rican cuisine. The drinks are strong and delicious. The main Lobby bar is a great spot to wait for your room, meet up with friends, or just enjoy happy hour in the air conditioning. Old San Juan is approximately 3 miles from La Concha resort for a 10-20 minute drive, depending on traffic. We parked our car at La Concha and took an Uber to Colon Plaza in Old San Juan for a cost of $7.25, it was only $6 back due to less traffic. We ended up playing tourist in OSJ, it is hard not to be taken in by the charm of the old city. The room, and resort, in general, is a simple modern design. White bed, white couch, with small pops of color sprinkled throughout with bright orange chairs, wall art, and bathroom tiles. While the bathroom was a bit on the small side, it was an efficient use of space and did not feel too cramped, in part due to the walk-in shower (no door or curtain) and sink layout. The room boasts an impressive amount of storage in the bathroom, closet, and bureau drawers. The bed is quite comfortable, and the pillows are perfect for a great night’s sleep. While we had an oceanfront view, I regret not upgrading to a full balcony. I did not think we would spend much time in the room, and I was correct, we didn’t. Any stay more than a couple nights, and I definitely recommend to splurge for the balcony room. Casino Del Mar entrance is just to the right from La Concha lobby entrance. The Casino is open 24/7 and is bigger than it looks at first glance. It has the feel of a mid-tier casino in Las Vegas with the typical Puerto Rico friendly natured hospitality. Security guards smiled and greeted us on way into the casino while keeping a careful glance at all the patrons. There are three pool areas. The Main pool is right outside the lobby with an adjacent cafe and bar. There are two swimming levels plus tiled waterfall. It is considered the family pool and is a comfortable spot with plenty of chairs and loungers. The Sereno Pool is downstairs on the beach overlooking the Atlantic Ocean and rock wall barrier. This is the party pool with dance music and poolside dancing. Ocean Terrace infinity pool is located near the Tower Suites. Tucked out of the way, it has full beach access and it adults only. Perfect for relaxing, no children or loud music, the Ocean Terrace pool is postcard perfect! The golden sand beach dominates the backside of La Concha resort. The sand is soft and clean from the edge of the resort all the way into at least 20 feet of the Atlantic Ocean (that is as far as I went into the water). Workers start the day collecting any trash on the beach before beach lounge chairs and umbrellas are brought out for guests. Be sure to check for the red flags indicating rough water, there are usually light, rolling waves and can get rougher in strong winds. Located at 18 degrees north of the equator the water is warm year round. La Concha does not have a spa on property. Zen Spa across the street on Ashford Avenue is excellent for any beauty treatment that you might need. For a full day of pampering, it is a 5-minute walk next door to the Condado Vanderbilt Spa. 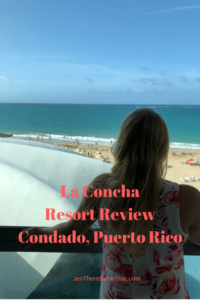 La Concha is an amazing luxury resort for a beach getaway. I have attended a few conferences and many happy hours on the property, and the service is always excellent. The perfect place to combine a couple days of relaxing beach time with exploring Old San Juan. I am refreshed and relaxed, which is exactly the point of my stay. I have never been to this part of the world. Puerto Rico is on my list to visit, may be sometime in life. This resort surely looks nice with cozy rooms and infinity pool and an adult pool idea is totally amazing. Thanks for sharing this place, it looks totally inviting. A hotel with 3 pools and private beach access? That’s the kind of hotel I’d love to stay in. Also, I’d love to have a room with a full balcony. Considering that the hotel is a little far from Old San Juan town, I’d probably like to spend one full day enjoying the facilities of the resort and swimming in the beach. Looks like La Concha is a great choice for that! What a location and the perfect resort . Le Concha looks perfect and the distance from San Juan is not much either as you have said . What else can a place offer a beach a spa and a casino the perfect mix for a great holiday. Looks like a clear winner to me and one I will keep in mind if I was looking for accommodation around this area. I have never been to Puerto Rico before but this resort looks amazing! I like the three pools! I don’t mind kids at all but sometimes it can be very busy so I understand why people would radar go to a different pool. The Infinity Pool looks amazing. A adult only zone is also a good idea – it is required at some places. The view from the resort is breathtaking – such a lovely place to stay. I’ve never heard of this location and it sounds like a great place to unwind and relax. I like the simplicity of the rooms and it’s nice that they have a pool too! I love the idea of multiple pools and an adults only pool! I don’t want to be a scrooge and keep the kids from having fun, but there’s really something to be said to being able to enjoy a kid free space. Growing up I always dreamed of having a balcony, but I’ll be honest and admit I hardly ever go on mine! Even when I’ve been on vacation and had a balcony with gorgeous ocean views. Hopefully other people are better at enjoying the perks of their accommodations! The kid-free zone is so necessary sometimes! What a glorious view from the room you stayed in! I like that the hotel is so close to the beach and that you can walk to a number of places nearby to eat or avail spa facilities. Oh and I think I would love the Ocean Terrace infinity pool! It looks so inviting. It is a great location, and the beach is glorious! This looks gorgeous! Although I am not a big fan of just lying on the beach, I would definitely go to one of these resorts. And I would definitely splurge on the balcony, because I love to have my coffee in the mornings with a view 🙂 I like simpler rooms, with a minimalist design. 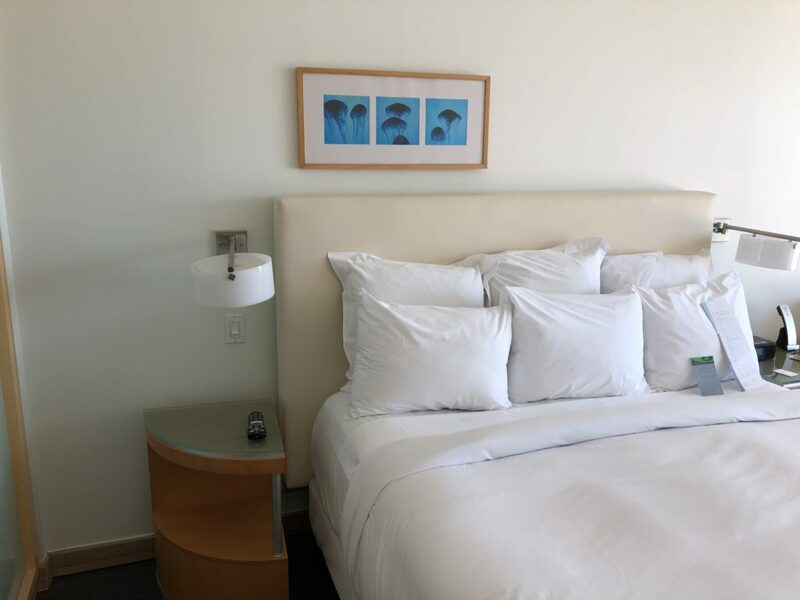 And I adore how many pillows there are on that bed :D:D:D I hope you enjoyed your staycation! It is the perfect spot to explore the city of San Juan and the historic Spanish streets in Old San Juan. 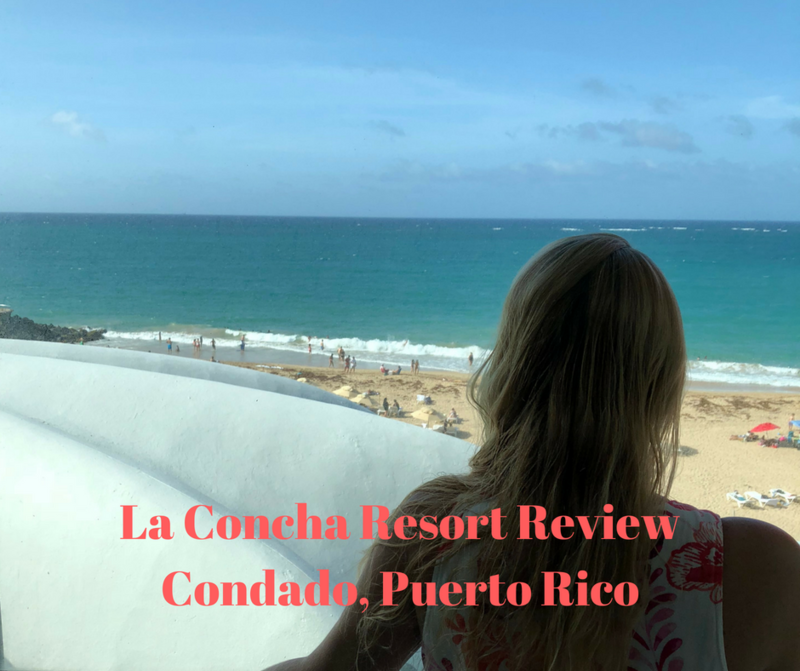 La Concha sounds like a perfect way to unwind in Puerto Rico. I’ve never been before, but will take your advice and book a balcony room. The pools are gorgeous, and what a view to have in front of you! Will remember this place for sure.